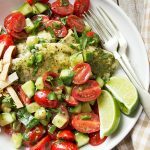 This Salsa Verde Fish with Fresh Salsa is perfect for a quick, easy and delicious weeknight meal! Disclosure: This post is sponsored by The Saucy Fish Co. As always, all opinions are my own. Thanks for supporting brands that support Seasons and Suppers. If your family is anything like mine, fish makes an appearance on the menu regularly! I love fish for a quick and healthy meal option. Even with fish though, I need to figure out what to do with it, how I’ll cook it and for how long. 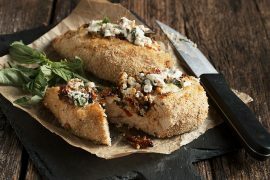 So I absolutely love the idea of fish minus the fuss with The Saucy Fish Co. line! The Saucy Fish Co. is all about that idea – creating perfect pairings of fish and sauce and making our mid-week dinners easy and delicious. Available in both cooked and ready to eat and frozen with a variety of fish and sauce options, there is something for everyone and every need. You’ll find a variety of inspiring flavour combinations to chose from. I tried several varieties of the frozen fish and sauce. Each one comes with the sauce and a cooking bag. I loved that part! No need to worry about how, or how long to cook the fish. You simply place the frozen fish in the bag and cook according to the instructions. Heat the sauce while the fish cooks. The fish came out perfectly cooked and I was ready to go with the simple, flavourful sauce. And yes, you cook it from frozen, so you don’t need to worry about defrosting. Just grab from the freezer and enjoy. The Saucy Fish Co. also has cooked and ready to eat fish with sauce options, that you can simply heat and enjoy anytime. Perfect for really rushed nights. Learn more and explore all the great varieties of fish and sauce on The Saucy Fish Co. Website. The Sauce Fish Co. products are also available at Loblaws and affiliated stores here in Canada. Look in the seafood case for the cooked, ready to eat or the frozen seafood case for the frozen options. There are an endless number of ways to enjoy The Saucy Fish Co. fish and sauce. I wanted to show one way I enjoyed it at my house. I started with The Saucy Fish Co. Tilapia with Salsa Verde Sauce. 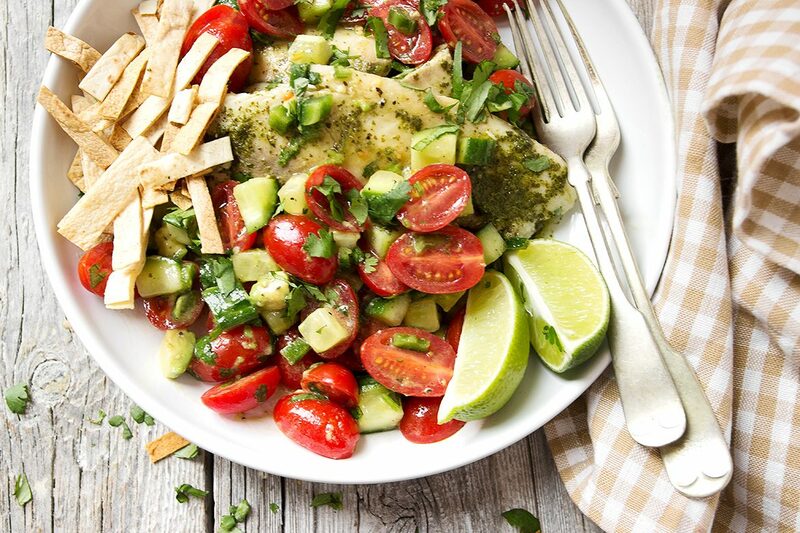 I made a quick, simple and delicious fresh salsa to accompany the Tilapia with Salsa Verde and cooked up some tortilla sticks along with my fish for a little crunch. And all made while the fish was cooking! The fresh salsa was a wonderful complement to the wonderful fish and salsa verde sauce and it was so easy to put together. I cooked the tortilla strips in the oven right alongside the fish, to make things easy. Delicious fish with salsa verde sauce and fresh salsa, for a quick, easy and fuss free dinner! Preheat oven according to package directions and place fish in cooking bag as instructed. Place on one side of a baking sheet and place in to preheated oven. Set timer for 15 minutes. Meanwhile warm sauce as directed. Prepare fresh tomato salsa by combining all ingredients and stirring well. Set aside. Prepare tortilla strips by brushing tortillas lightly with olive oil and seasoning with a bit of salt and pepper. Use a pizza cutter or knife to cut in to thin strips about 2-3 inches long. After fish has cooked for 15 minutes, remove from oven. Scatter the tortilla strips on the empty side of the baking sheet, in an even, single layer. Return to the oven with the fish and set timer for the remaining 8 minutes cook time. Remove fish to serving plates. Top with warmed sauce and spoon fresh salsa over-top. Serve warm tortilla strips alongside. All these wonderful flavors sound perfect for a great tilapia fillet! We want to eat more fish and this colorful dish is a great way to start. Love it! I definitely am a fish lover. Basically I will ALWAYS chose to eat fish over meat or chicken… I think it’s the former pescatarian in me. I just love me some fish. And this fish looks AMAZING! I’ve never heard of The Saucy Fish Co., but that makes sense if they are Canada based. :( They need to get their products down here in the states, because I’d totally buy them on the regular! 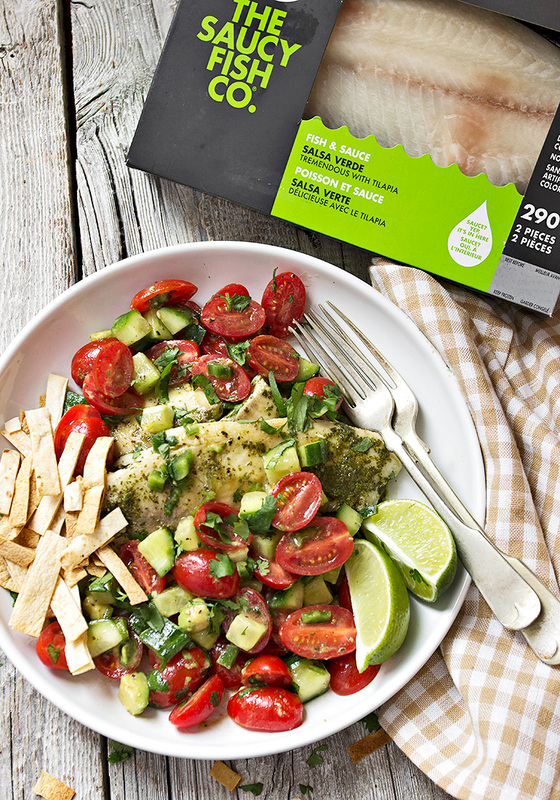 LOVING this salsa verde tilapia and your pairing of the fresh salsa is just perfect! 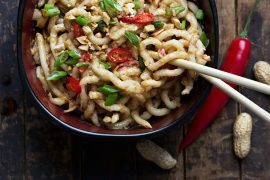 I’m going to have to DIY the fish in my kitchen, because I am seriously craving this! Cheers, Jennifer! 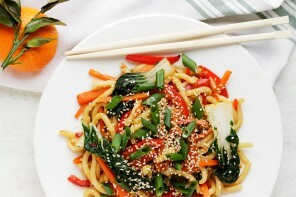 Such a gorgeous, colorful, healthy dish Jennifer! Love it! As we head into spring, I’ve been craving fresh and light meals. This is just perfect! Thanks Laura :) I have been, too! I love this idea! How perfect for busy nights when we’re tempted to order out. This looks way better as well as way healthier! 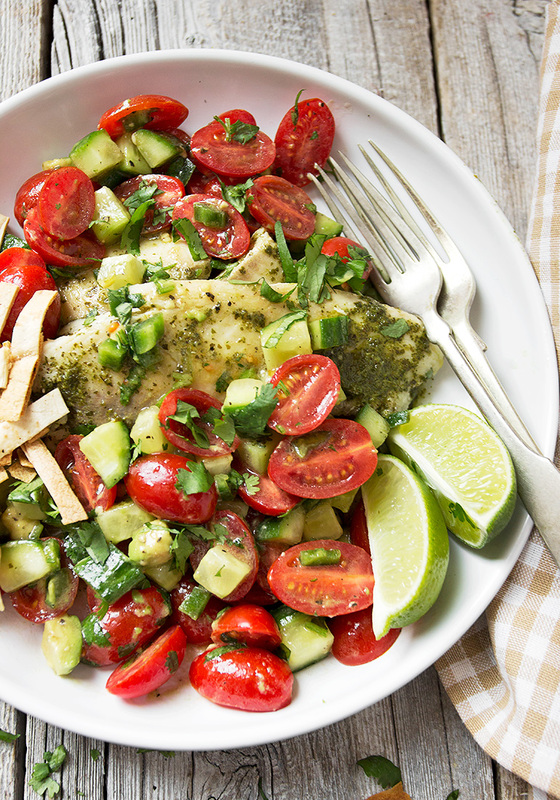 We LOVE tilapia, it’s so light and fresh, and CHEAP! This is a beautiful way to serve it Jennifer, thanks. I’m not sure I can get this brand down here, but I’m going to look for it. Thanks Sue and yes, tilapia is always a nice light meal, for sure. Loved it with the fresh salsa.